September is one of those months that feels like summer one minute and autumn the next. It’s this fruitfulness that gives the colours now as the flowers finish, combined with the gold of harvested fields. And the first leaves begin to turn gold later in the month. We had a good early summer in this area, quite warm and very dry. Then it went cold and wettish. The corn crops might be suffering, as they like it the other way round! However, there should be a great fruit harvest. The earlier crops in the summer included an excellent harvest of English strawberries, blueberries and cherries – I even bought English apricots this year. There were more berries than usual on my wild strawberry plants. Then came the cherry-plums, those early small round red or gold plums which flourish around here, along with their cultivated version, the pissard plum – the dark one with the bronze leaves. Now in September we have the true plums and damsons. The old plum tree at the Tardebigge Lime Kilns orchard is so laden with fruit that one of the branches has had to be propped up to prevent it breaking off. The damsons are also packed with fruit. All five apple trees are fruiting beautifully now that the coppiced hazel hedge lets in the sunlight. The Lime Kilns are open for the Heritage Weekend on September 9 and 10, so go and have a look. In my garden the golden plums so typical of Withybed Green are ripe and sweet. I think I have finally discovered which variety they are. A lot of people say they are Pershore Egg Plums but they are not the same. They are very sweet when ripe and have a distinctive red fleck on the skin. I think the tree is one called Warwickshire Drooper. Many of ours are sucker-grown from very old trees. This is the kind of plum that used to grow along the canal near the Station Road bridge in Alvechurch until Network Rail destroyed them for a temporary car park. Damsons of course are also a Midland speciality, though one which is gradually disappearing as the old trees go and new ones are not planted. They have gone feral in lots of places and grow in hedges and along the canal. They are sweet enough to eat raw when ripe, but like the local plums they don’t keep long once ripe. Our native wild plums, though, are not ripe yet. The wild plum or bullace is set and turned purple, but will not be sweet until October. The small sloe or blackthorn fruit weren’t considered ripe till after the first frost, when you could make your sloe gin. But you can make your damson gin without any sugar if you like, any time now! Meantime the early apples are ready. The wild crab apples are small and golden, and sour! 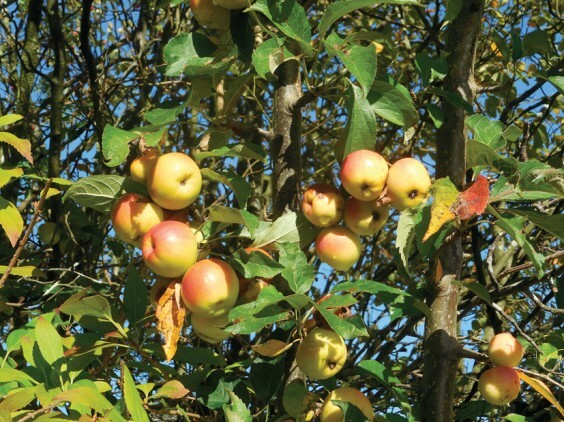 The early eating apples tend to be red-skinned types, but there are some old yellow varieties too, often growing as wildings – seeded by birds. None of these early apples keep well, so you need to eat them quickly. You probably won’t be able to give them away this year, as everybody has so many! There are still some flowers in September, and many of these are golden. One of the hawkbits, which I mentioned in July, is the autumn hawkbit. This is a tall, handsome late-flowering plant with single dandelion-type flowers. The ubiquitous ragwort is still about in September too. Another of the daisy family plants, the pretty tansy, should still be flowering now. This is the one with the large heads of little button like yellow flowers, an old herb with a strong smell. There is still some hanging on to life on Alvechurch station. But there are also some new flowers. Along the canal is orange balsam, a very late summer flower. It’s very attractive, and although related to the Indian Balsam it is a native plant and does not out-compete other plants. The latest flowering canalside plant is the bur-marigold, another in the daisy family. This has attractive ferny leaves. The flower had a large centre and very small yellow outer florets. It’s quite rare these days, and we’re lucky to have it around here. It isn’t the latest flowering plant in the hedges, though. That is the ivy. At this time of year, ivy is full of heads of small yellowish flowers with a very strong scent, which many people find unpleasant. The flowers are full of pollen and nectar, and ivy is full in September of late bees and even butterflies. Last year someone called me over to look at an ivy-covered garden hedge in Station Road which was buzzing and alive with bees. There is even a special butterfly that feeds on ivy. This is the holly blue. As its name suggests, in May it feeds on holly flowers. But it often has a second brood, and in September it feeds on ivy. So the holly and the ivy are linked in ways other than the Christmas carol! Insects are very active still in September, including the spider-like harvestmen, and you will find spiders too of all kinds. One of the lovely sights of a September morning is a dew-spangled spider’s web on the hedge. Elsewhere in the hedges are berries galore, colourful in red and black. The edible ones you can find now include elderberries, blackberries of course, rosehips and hawthorn. All of these can form part of hedgerow jams and chutneys, especially if paired with crab apples. The prettiest of the poisonous ones is bryony, which makes beautiful necklace-like loops along the hedges. The drying out of grass and the start of the turning of the leaves gives a gentle golden glow to this time of year, where things are growing naturally and not mown to permanent green. Many other plants, such as hops, dock and bracken, turn gold too. Fungi can be colourful, ranging from silvery puffballs to the golden wax-caps. The first native trees to start changing colour are the horse chestnut, hazel and ash, though some non-native ones turn even earlier. At the start of September our native trees are usually still green. They will turn soon, though, and we will see their colours later in the month. Oaks, though the leaves are still green, carry golden-brown acorns and also oak-apples, a growth caused by the gall wasp. Hazels have golden-brown nuts among their golden leaves, though the squirrels will probably have had the nuts already. Horse chestnuts go earthy brown, and of course have conkers. Ash especially changes colour to gold very suddenly, losing its leaves soon afterwards. So look out for the ash going gold, and don’t blink, or you’ll miss it! As geese wheel and circle, going nowhere. In the harvest moon, and will come down.